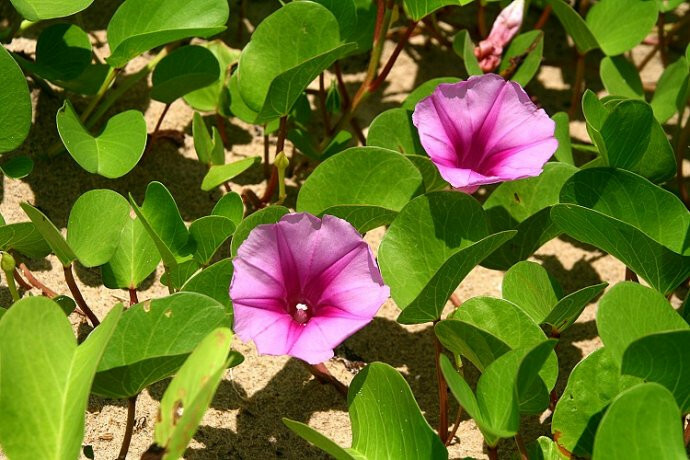 The drug is the dried or fresh whole herb of Ipomoea pescaprae(L. )Sweet (Family Convolvulaceae), growing on the beach or on sunny roadsides, and distributed in Fujian, Taiwan, Guangdong, Hainan, Guangxi and Yunnan of China. Leaf contains mucilage, essential oils, resins, sterols, behenic acid, melissic acid, myristic acid, butyric acid, etc. Whole herb is used as anti-rheumatic, diuretic and antioncotic, to remove blood stasis, for the treatment of pain due to rheumatism, carbuncle, sores, boils, hemorrhoids, urticaria, mastitis, acute gastritis, and elephantiasis due to filaria etc. Decoct 30~60 g of the fresh. Proper dosage is for external application, pounded for applying.